It seemed like a good idea at the time. Park the truck along a turnout on the Geology Tour Road, leaving the relative safety of being on a maintained and a somewhat regularly traveled dirt road, and set off on foot across the desert to a somewhat formidable looking pile of rocks collectively known as The Towers of Uncertainty. Afterall, the name alone demanded a visit. And as things turned out, the only uncertainty Murbachi and I encountered was in determining the names of a few of the various giant rock formations we had set out to visit. We parked near stop #5 of the Geology Tour, "Rock Piles" (which seemed appropriate), geared up and headed northwest towards uncertainty. 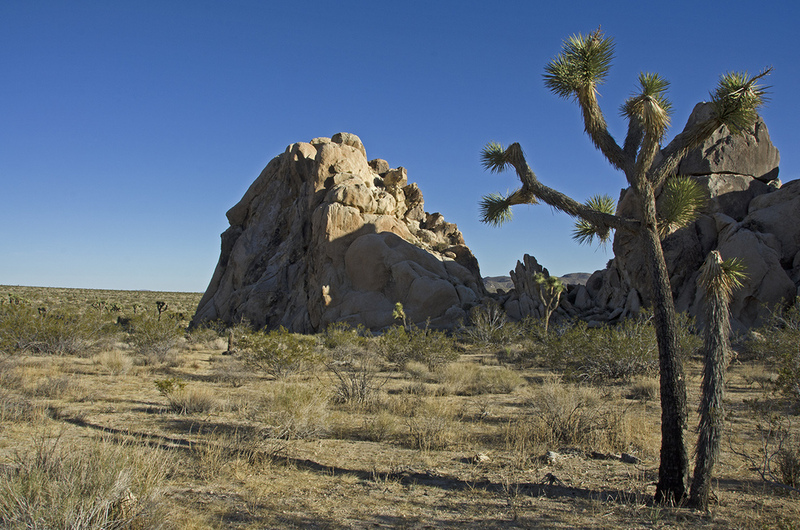 Apparently, every single rock in J Tree has a name, even that sharp pointy one that always ends up under your sleeping bag. Now, I'm not talking about names like Bob, Sally or Abendigo. I'm talking about some really off-the-wall, crazy out-of-context and probably fever induced monikers possibly bestowed after a fall from said rock. And that's part of what makes wandering around in the desert fun. Getting to know the rocks out at J Tree on a first name basis. And wondering how on earth they got their names. Some are understandable, others? Well, you can be the judge. I'm pretty sure that the rock climbing community that thrives at J Tree is responsible for the vast majority of named rocks in the park. Let's take a look at some of the desert denizens Murbachi and I stumbled over in our hike to uncertainty. Shortly after beginning the hike to uncertainty, we saw this jumble of boulders off to our left. It's know by name of Rocky Marciano. One of the taller formations and part of a "backbone" in the Towers of Uncertainty group, Demon Dome doesn't seem evil or demonic. But then again, I haven't tried to climb it. Yet. Looks like some folks have spent some time here at Cave Rock. Just a reminder, campfires such as this are illegal in Joshua Tree. Don't take a chance at starting a fire. There are climbing routes on both the north and the west side of Cave Rock. 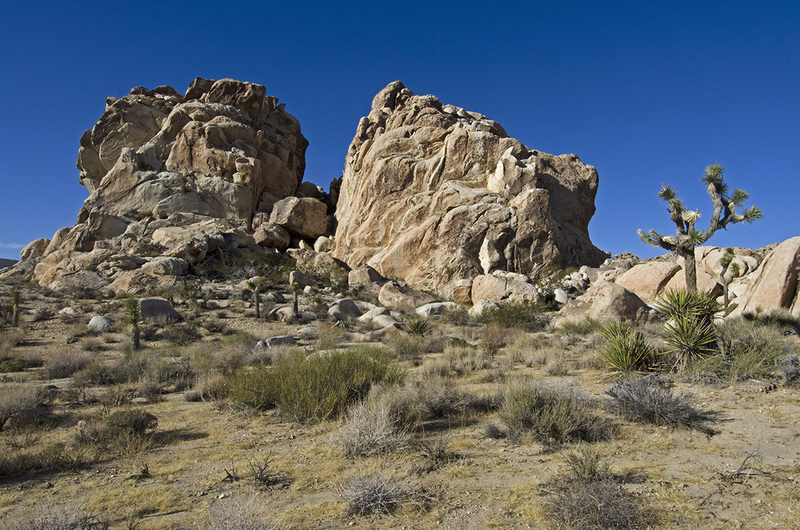 The large rock formation on the right is known as Sunlight Rock. It's part of a series of rocks that form the westernmost part of the Towers of Uncertainty. Some folks look at a rock like that and say, "I want to climb it." I say, "I want to take a picture of it." Other side of Reef Rock - can you spot the Raptor nest? 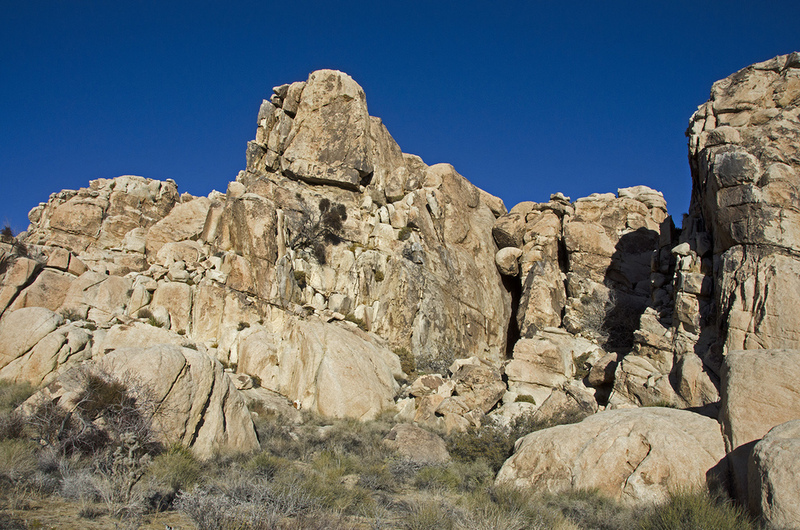 The large section of solid rock is known as Reef Rock, it's the westernmost of the three northern formations. It's got a lot of horizontal cracks and has a good number of climbing routes to the top. 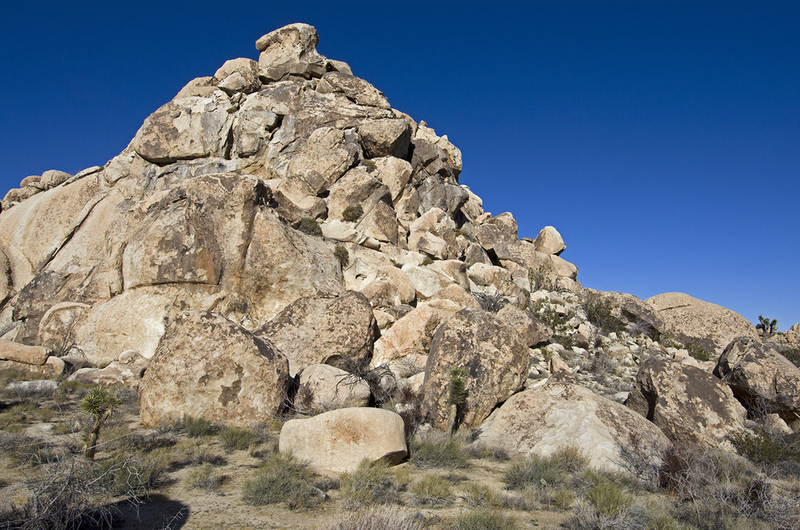 Gravity Rock is part of the formation which includes Reef Rock. Perhaps the reason for the name is that big chunk of rock that seems like it is defying gravity, just waiting for a 7.0 to send it crashing to the desert floor. The Crows' Nest didn't have any nests that I could spot. It's the easternmost rock at the northern section of the Towers. That puts it closest to the road. I wonder how many people driving by have looked at it while climbers have been sitting on top. After exploring the Towers of Uncertainty, Murbachi and I set out to see if we could find the fabled Lost Pencil of Pleasant Valley. It's located about 1-1/4 miles southwest of the Towers and we thought we had enough daylight left to be able to find it and make it back to the truck without any uncertainty. 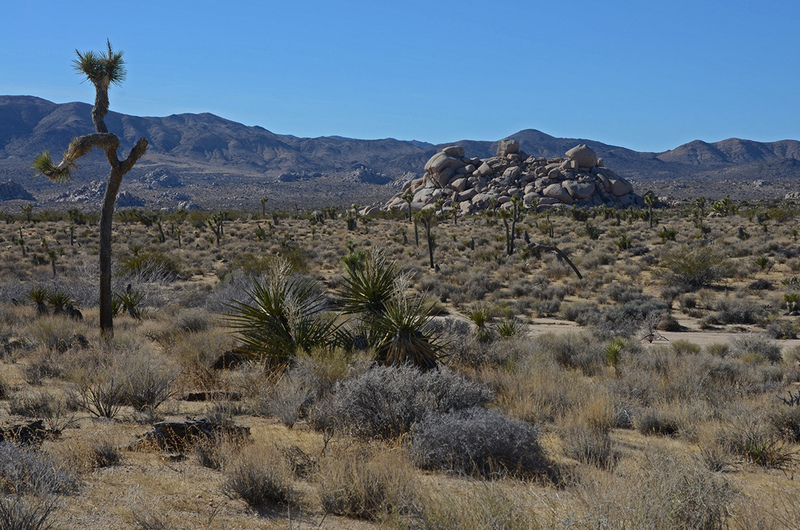 The trek is fairly flat and easy going, there is no trail....just cross-desert hiking. Jerry's Quarry with Malapai Hill off in the distance to the right. 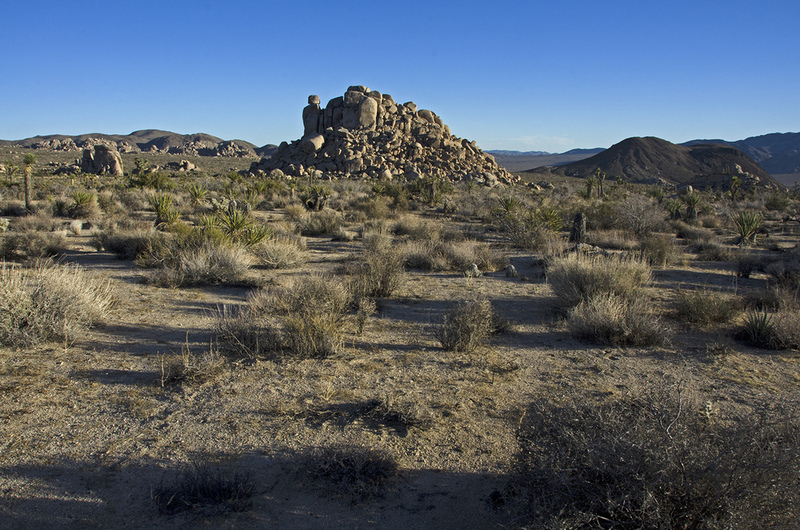 Along the way we passed Jerry's Quarry, a complex set of boulders and rocks that sits pretty high off the desert floor. The piles and jumbles of boulders out here never cease to amaze me. A little more hiking and there it was, the Lost Pencil. 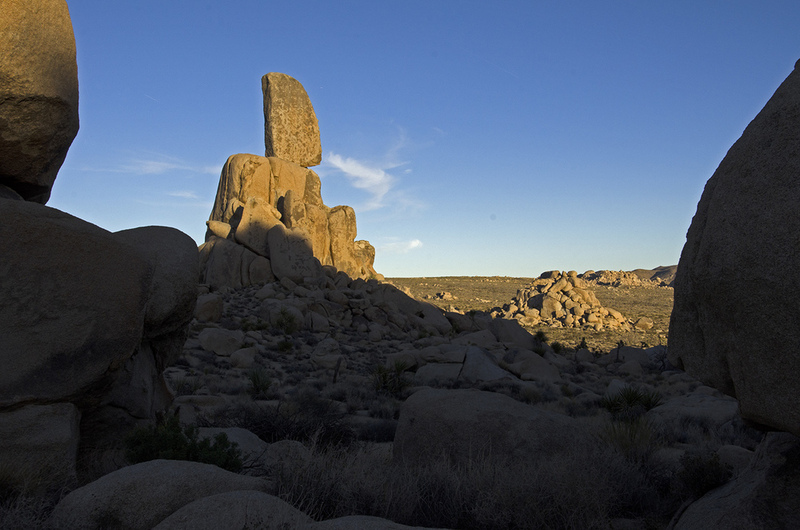 A giant, balanced pillar of rock high above the desert floor. It's a lot more impressive in person than in picture. We were fast loosing the light and tried to hurry around the backside for a few more pictures before shadows overtook the Pencil. Be sure to hike on over to Murbachi's website and wander through his 3D images of this same area. His photos are quite amazing. Click HERE to be magically transported. After circling the Lost Pencil, we headed back to the truck. All in all, I can say without any uncertainty at all, that the afternoon's hike had been a great success. The Towers of Uncertainty, while still mysterious, were now certain and that which had been lost was now found.